Have you ever tried to send large files through email or any other medium ? I'm sure you definitely did. But do you know Gmail and yahoo has file upload limit i.e just 25 MB. So what to do when you want to send file containing size more that 100 MB ? How you send big files online or how to upload files larger than 25 MB ? Are these question blowing your mind ? Don't worry you will find a very nice solution today. In this post you will find a quick way to send large files over email that are too big. Check out our 8 best methods to transfer big files over internet. Some companies and people always need to send large files and they pay huge amount of money for this. Due to their business or profession they have to send large files online and they that's why spent lots of dollars just for sending large files without even realizing that they can send these things for free. Some email service proving companies allow only 10 MB file upload limit while some famous companies like Gmail and yahoo allow us to attach 25 MB file. But as I said above we might have to send whole photo album to client/friend. So what to do in this case ? In this case you can check out 8 amazing and free services available to transfer big files online for free. I have mentioned 8 free online tools which let you send your large file. Each tool comes with its own size capacity but its definitely more than email. Some of them are pretty popular like Google drive, One drive, Dropbox, etc. So let quickly check it out them all. MailBigFile is an amazing free tool to upload files. 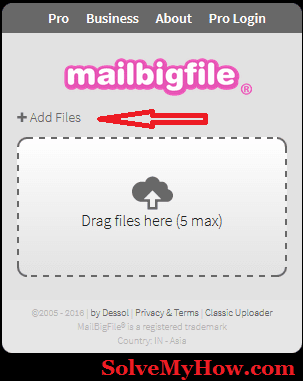 MailBigFile allows you to send files up to 2GB in size. It also allows multiple file upload functionality (Max 5 files). The UI is pretty clean and this tools is pretty easy to use. Look at the snap shot above. You can click on "+Add Files" button to upload files. Just remember file size should not be more that 2GB. If you want to upload file having size more that 2GB than you should try another tool from the list. We Transfer is another free tool to send large files for free. It has the most straightforward functionality to transfer big files over internet. As Mail Big File, you can upload max 2GB file. Though you can upload multiple files at a time. The UI is pretty decent and clean. Any newbie can use this tool very easily. The only cons about We Transfer is the shared URL will be expired after 7 days. So if you try to open it after 7 days it will show you "page not found error". They also have We Transfer Plus pack where you can upload and send file upto 20GB. It has many other pros too such as you can also customize your sharing URL. Your URL won't expire anyday. You can add password to transfer and much more. I guess this tool doesn't need any introduction. Dropbox is the most famous cloud service providing company. You can share files with other dropbox users easily. You can also provide them read/write permission. You can also create the links for uploaded files and share it with your friends or clients. They don't need dropbox account to download your stuff. Dropbox currently allow you to upload 2GB of free data. You can make it 16GB through referrals. The UI of dropbox is pretty clean. Dropbox also available on android and iOS platforms. So you can upload and send stuffs via mobile apps too. I'm personally using dropbox since long and all I can say is I'm dam satisfied. One Drive is owned by Microsoft so we shouldn't need to worry about security and privacy. You can create free account with one drive and you will get 15 GB free file upload space which you can use to share your personal stuff with your friends and family. You can earn 500 MB for each account sign up via you referral link. This is the nice scheme right ? You can also earn 15 GB more space by linking your mobile camera roll. The UI is pretty clean and decent. You can create the full as well as short links with one drive just like goo.gl ! Google Drive is the world's best cloud service. If you have Gmail ID, you can use Google drive now. The only per-requisite is you need gmail id to use google drive. Google drive - Access anywhere, at any place, at anytime. Its there tag line which really impress me. You can access you things from anywhere in the world. Google drive gives free 15GB space first which you can use to send large files free. People also used to ask, how to send large files through gmail. As you know gmail has file upload limit i.e only 25MB. So in this case you can use Google drive to send files large that 25 MB for free. It pretty secure by end to end encryption. You will get the link once you upload any file. You can share that link with your friends or people who can download you stuff. If you're a Mac user than you might don't know that you can send large files for free in Yosemite's mail app. 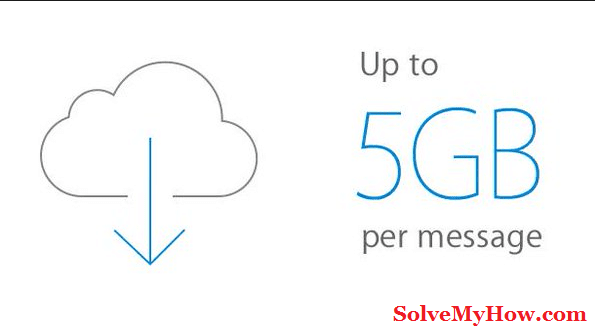 You can send upto 5 GB large file at a time. Sugar Sync would have been on the top of the table but the reason I didn't recommend you is due to its paid option. Just couple of months ago, it got rid of its free account option. So now if you wanted to use sugar sync you have to pay them. Still you can use sugar sync for free by using 30 days free trail. In which you are allowed to use sugar sync for only 30 days and you are allowed to upload 5 GB of data. So if you have money you can go for sugar sync else there are lot of option/alternatives available, you can use them instead. High Tail comes last in the list due to reason. This tool is pretty complicated to use. It only allows you to upload 250 MB of data. The UI is pretty cleaner. It allows you to upload and store upto 2 GB of data. High Tail also offer secure data encryption means you data will be encrypted and store here. So its pretty secure tool. It also offers receipt verification (unique for other tools) and it also have mobile and desktop access. So this was all about how to send large files, videos, photos to anyone for free. I hope you found this tutorial worth reading and sharing. If you have any doubt on how to do this stuff then you can watch this amazing video. In collecting all this valuable information, it really takes lot of time but we do not want anything in return from you but just one favour. You can also subscribe for SolveMyHow newsletter to get latest updates about blogging, SEO and tips and tricks tutorials right into your inbox.